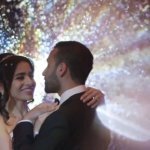 Being part of the wedding industry has been an absolute dream come true for us here at SDE Weddings, Toronto’s premier wedding videography, cinematography and photobooth group. Through the countless many weddings we’ve filmed throughout the many years we’ve played a part in this industry, the one true lesson always remains at the end of the day; that it is the genuine bond between people that brings the best out of all of us, and certainly none-the-least on a day as monumental and life-changing as a wedding day. So for our videographers and cinematographers, it was the highest honour we could possibly have to work on the wedding of two of our good friends in the wedding industry, Joe & Kayla, who held their wondrous wedding ceremony and celebration just this previous fall on September 17th, 2016 with a solemn ceremony at Brampton’s St. Patrick’s Church and a superlative celebration held at The Royal Ambassador Banquet Hall in Caledon, in a breathtaking countryside villa just northwest of Toronto. Joe & Kayla, as we mentioned, are our good friends in the wedding industry; with Joe as a DJ at Good Vibrations DJ Services and Kayla as a wedding planner at Bridal Solutions, both of whom we’ve worked with countless many times before on many wonderful wedding day events. Joe & Kayla had actually initially met at Good Vibrations HQ, and from there-on formed a bond that would culminate in a shared vow and a life in love together. So it’s particularly special for us to return the favour in a way, for our history of excellent wedding day collaborations with them, by providing our exemplary wedding videography and cinematography services for their very own wedding ceremony and celebration, even providing our namesake same-day-edit service as a highlight to close the couple’s excellent evening. 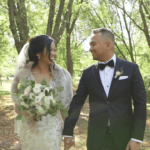 So join us as we recall one of our most treasured and sentimental wedding day works by our videographers and cinematographers, and have a preview of Joe & Kayla’s unforgettable wedding-industry wedding. Work on Joe & Kayla’s wedding day for our videographers and cinematographers began on a very special autumn season morning, with our crew arriving at both the bride’s and groom’s residences to film the getting-ready process for the big day ahead. One of our favourite morning scenes from our videographers and cinematographers was Kayla’s reveal to her closest family and friends. With a special wedding day gift of a custom-made quilt featuring a collage of Joe & Kayla’s favourite pictures together draped atop the stairs, this scene couldn’t have gone better on film; of Kayla’s first steps on a long life journey ahead. Another special scene was of the couple’s “first touch” on their wedding day morning. Usually couples opt for a first-look for their wedding day, but Joe & Kayla had decided on a much deeper, more sentimental gesture to start off a lifetime and eternity together; a truly touching scene of the couple holding hands, as though they were pacing themselves before facing the future, the great unknown beyond their horizon. So it was absolutely special for our videographers and cinematographers to capture this utmost heartwarming moment, of Joe & Kayla bracing themselves before taking the plunge and braving the storm ahead. And as for the ultimate moment of the day, Joe & Kayla’s wedding vows shared at Brampton’s St. Patrick’s Church was the highlight of our highlight. Capturing the exchange of vows, the subtle zoom-in on the ring exchange, and the storm of kisses shared between newlyweds afterwards would be the moment that made it all worthwhile for our videographers and cinematographers; filming a dream come true for a couple who themselves have shared in the same memory for countless other couples before, and seeing the very same moment play out in their own lives. Truly a touching wedding day memory, and for our videographers and cinematographers, one that’s for the ages. With vows complete and a lifelong journey ahead of them, Joe & Kayla’s first step would be to venture north, to a breathtaking rural Ontario countryside getaway at The Royal Ambassador Banquet Hall in Caledon, just northwest of our home in Toronto. A beautiful country scene for our videographers and cinematographers, Joe & Kayla shared with their bridesmaids and groomsmen a sincerely memorable time taking scenic pictures of the countryside. And to close the evening, held their wedding day celebration in an absolutely gorgeous ceremony setup. A favorite scene from our videographers and cinematographers from the evening was of the couple’s cake-cutting by candlelight, a truly tender moment shared between husband and wife, and a memory to last a lifetime. And with our highlight reel featuring the many and varied cheers and salutations to Joe & Kayla from their closest friends and family, and our very own same-day-edit of the many special scenes throughout the wedding day to close the night, Joe & Kayla, a couple of wedding-industry veterans had completed their very own perfect wedding day; with all things coming full circle. And with all that said, we here at SDE Weddings, Toronto’s premier wedding videography, cinematography and photobooth group, have nothing but the best wishes for Joe & Kayla on their future together. Our videographers and cinematographers truly thank them for the great honour in choosing us as their videography and cinematography service for their wedding day, a true act of friendship and one that’s very dear to us. In the end, we hope that our work with Joe & Kayla will serve as a testament to the couple’s love and dedication for one another, and we hope to see both of them soon for many more unforgettable collaborations ahead.